Warparty is a game that has been around for a while in Early Access. 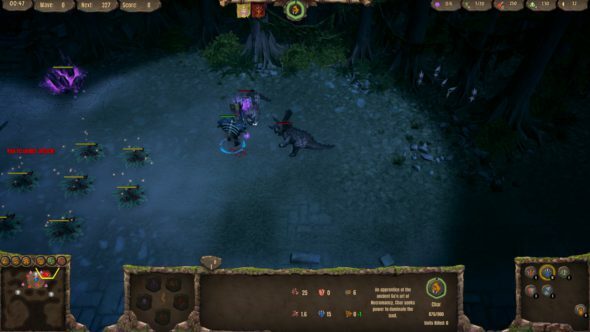 Finally, the developers from Warcave and Crazy Monkey Studios have let the dinosaurs out of their cage and released the full game on PC, Switch, PS4 and Xbox One. In this unique RTS game you set out to search for the ancient Go’n Power while taking on other tribes and dinosaurs. A long time ago, an ancient race discovered a magical power which they called after their tribe, the Go’n Power. They had found out various uses for this power: create life, control it and end it, including the creation and control of various dinosaurs. However, the tribe expanded too fast and it got divided in two. After a long conflict, only the remnants remain, but their artefacts still got the energy that it used to have. Now tribes travel the world amongst the dinosaurs in order to find the artefacts and restore the power that once was. The story of Warparty is an original one for the RTS genre. It immediately gets told when you launch the game and is brought to the player by the use of cutscenes which are fully voiced and completed by subtitles. By telling the story right away, you immediately get the feeling like you’re part of the game. 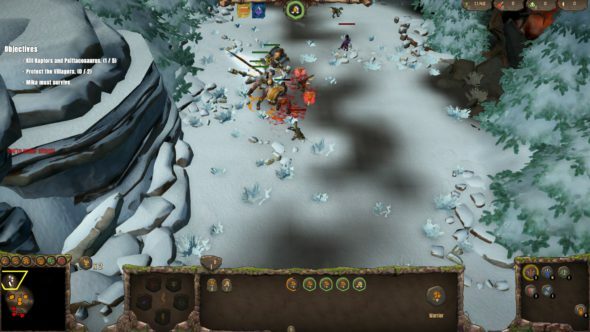 Warparty has a cartoony style mixed with 3D-graphics. The game has bright colours causing it to be really easy to follow and fun to play. What also benefits to this feeling is that the different tribes have an unique look and everything is worked out and quite detailed. While playing the game, you most likely will not encounter any lag graphically. The developers managed to give the game a unique stone age-like look which is supported by a good story. Putting this all together makes the graphics feel even more complete. 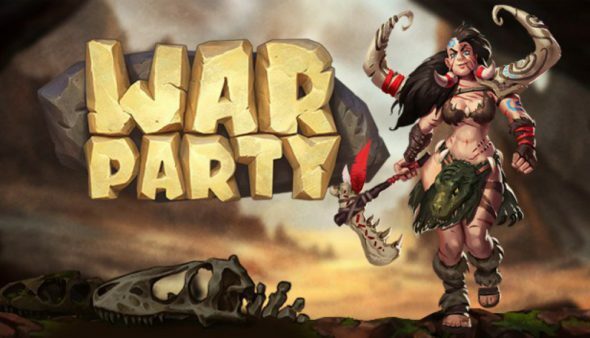 While Warparty takes place in the stone age, the sound that is playing in the background gives more of a jungle vibe. Yet, this isn’t necessarily a bad thing since it still provides a fun vibe to it. As mentioned before, the game is fully voice-acted. In comparison to the sound that is playing, the voice matches the game, and provides a feeling that there are real tribesman speaking to you. The sound effects also match with everything. If you are attacking an enemy, gathering food or building your settlement, it all has a different sound, adding to the feeling of a complete game. 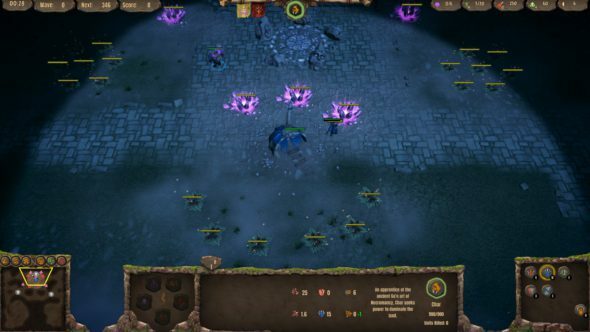 Warparty is a RTS-game, which has a lot in common with games like Age of Empires. However, the developers added some tweaks to it here and there, distinguishing it from other games similar to it, not making it a total rip-off. The game has a couple of different game modes, each giving the players unique goals to achieve, and different things to do. First, there is the campaign mode. In the campaign you will have to achieve different given goals, with the ultimate goal to discover the purpose of the Go’n Power. Goals that you may encounter are for example; build a specific building or kill a given enemy or dinosaur. When you start the campaign mode, you can choose between three faction to play with, each having their own unique benefits and weaknesses. You can choose between the Wildlanders, Vithara and Necromas. Each faction ensures a different gameplay. It’s a bit like cavemen vs. nature people vs. the undead. A second game mode the game offers is the AI Skirmish, where it is simply your goal to build your settlement and troops and defeat the enemy tribes as soon as possible. The last game mode that you will be able to play is the survival mode. In this mode, you will have to survive different waves of enemies which are getting stronger with each wave that passes. Warparty isn’t that difficult to play and understand, but when you like a challenge, you can always set the difficulty higher. Currently, there are five difficulty levels; very easy, easy, normal, hard and very hard. The in-game controls that are used aren’t that hard to understand either, but if you are struggling with them there is a nice worked out tutorial that you can choose to play in order to get familiar with them. However, at some points in the game you will find out that the controls can be a bit buggy, which can be a bit frustrating. 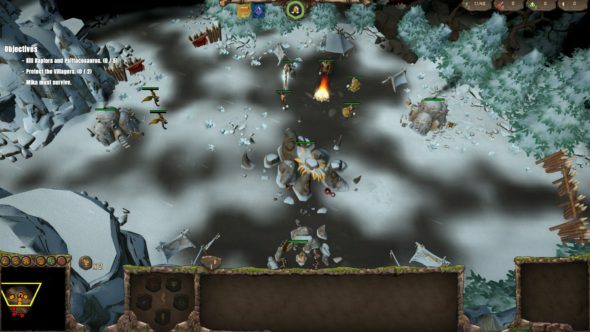 Warparty is a unique take on the typical RTS genre. With an original story combined with beautiful graphics and a unique gameplay, the developers made something that you want to play. However, not everything about the game is perfect. The sound does not really match the stone age vibe the game is trying to provide and sometimes the controls are feeling a bit buggy. But, if you are a fan or RTS games, Warparty is a game that you definitely want to have in your library.